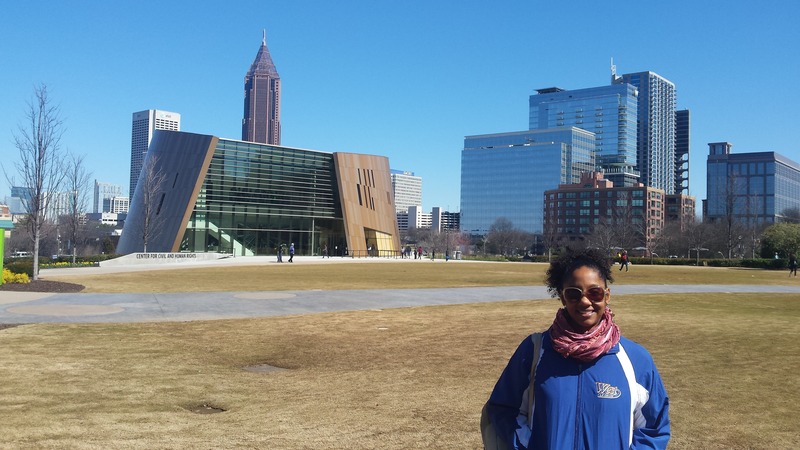 This new museum, opened in June 2014, is housed in Centennial Olympic Park along with the Georgia Aquarium and the World of Coca-Cola. I visited with my cousin on a beautiful sunny Saturday. 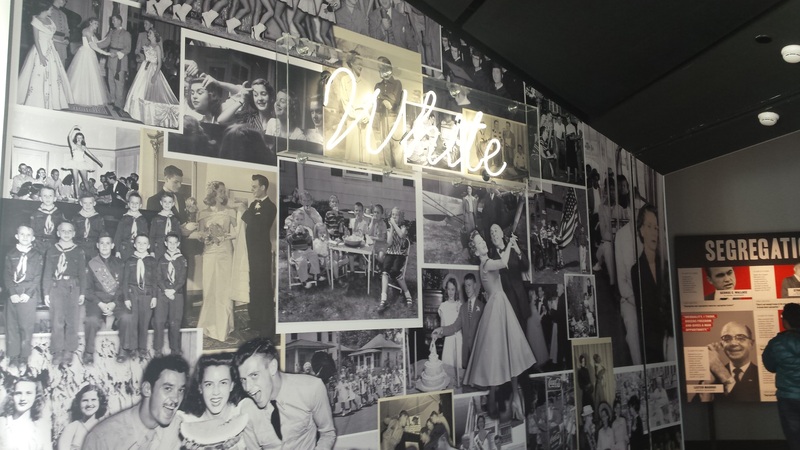 Visitors enter the museum’s permanent exhibit on the ground floor, Rolls Down Like Water: The American Civil Rights Movement gallery, between two walls, each decorated with a collage of black and white photos. 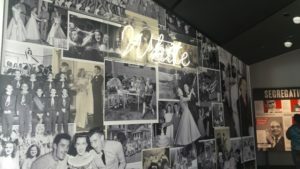 Up on the left the wall is a neon sign that reads in cursive “White” and the right wall holds the “Colored” sign, mimicking signs pervasive in the Jim Crow South. The photos covering the walls, however, portray a different reality. Every photo depicts some element of wholesome southern life like ballet class, debutante balls, motorcycle riding, weddings, church choirs, and picnics. My cousin, who lived through the civil rights movement, immediately understood the point of these collages to use powerful images to demonstrate the commonalities of two racial groups, even during a period when they were so divided. This is a creative effective use of these images, but it left me wondering about issues of social class. Just beyond these two walls at the entrance is an exhibit featuring photographs and quotations from the most prominent segregationists of the movement including George Wallace, Strom Thurman, and Jim Clark. 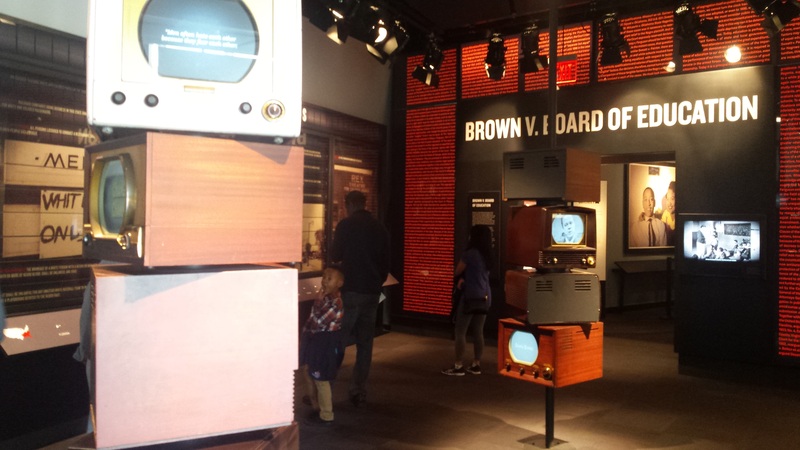 To enhance this exhibit, the museum has a unique display featuring four archaic televisions stacked atop one another each playing a disturbing sound byte from one of the well-known racists. 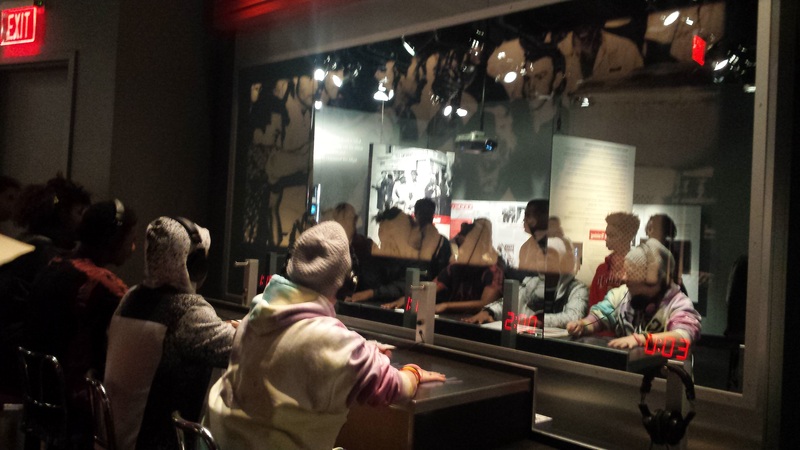 The rest of the gallery is filled with state-of-the art exhibits and panels offering insights into the American Civil Rights Movement. A giant portrait of Emmitt Till and his mother hang on one wall, panels introducing prominent figures in school and bus desegregation, Ruby Bridges, Rosa Parks, and Claudette Colvin sit in the middle of the room, and walls featuring Jim Crow Laws and Brown versus Board of Education line the perimeter. Like the other Civil Rights museums I have visited, this museum houses a replica of a bus to honor the Freedom Riders, but this exhibit is different. This bus is wallpapered with the photographs of the Freedom Riders, Black and White young adults from all over the nation. My cousin recognized at least one classmate from UCLA, and she appreciated this depiction of these young activists, that included many Whites willing to risk their lives too for the movement. From those exhibits in the rear of the first room in the gallery, we moved into a long room featuring an extensive timeline chronicling the March on Washington along with panoramic video footage. In this exhibit, I heard for the first time of Odetta, a folk singer known, according to the timeline, as “The Voice of the Civil Rights Movement,” who performed at the March. 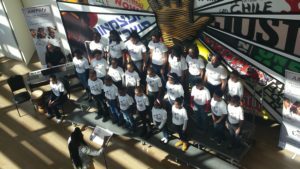 The next rooms include remembrances dedicated to the four girls killed at Sixteenth Street Baptist Church, Martin Luther King Jr. and other martyrs of the Movement. 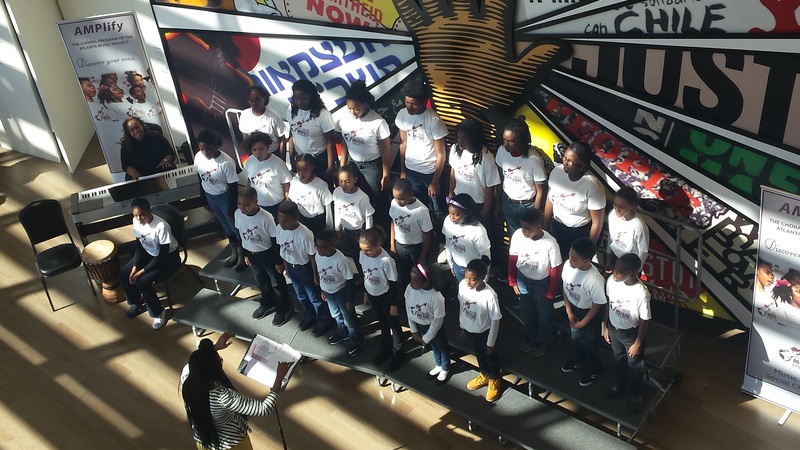 From the upper level of the museum, we were fortunate to catch an Atlanta Music Project children’s choral concert held in the lobby below. 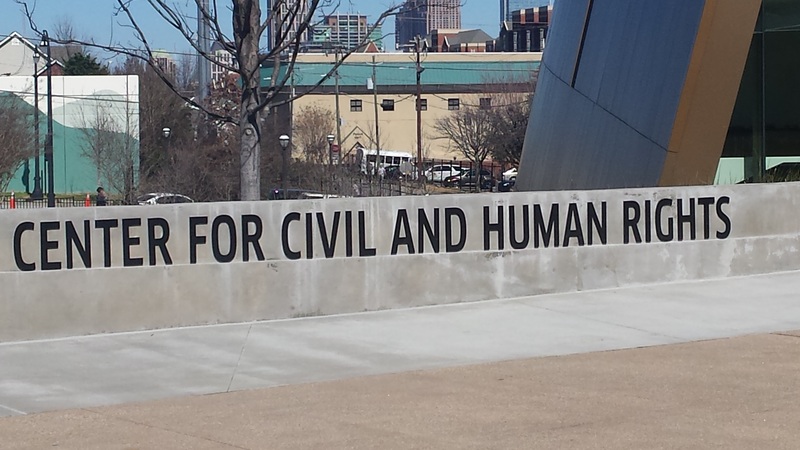 Then, we moved on to view the Spark of Conviction: Global Human Rights Movement gallery. 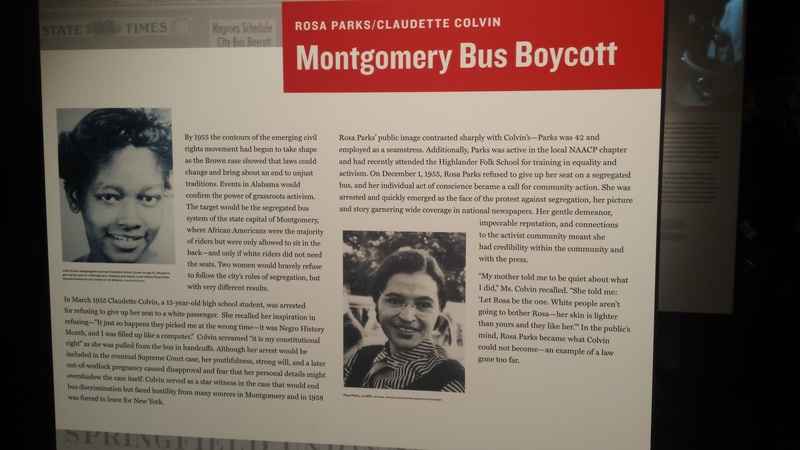 This gallery is clearly meant to inform visitors like the Civil Rights Movement gallery below but also to call folks to action. 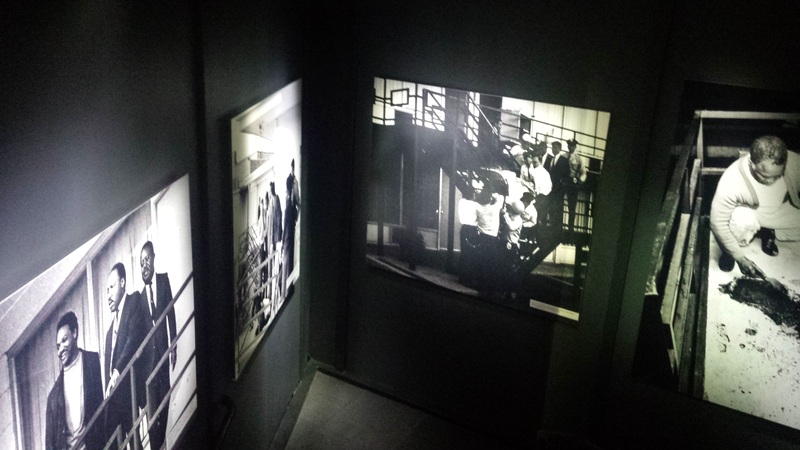 The gallery includes a wall where visitors are invited to learn more about a variety of contemporary human rights issues. There are handouts for visitors to take and use to discuss the issues with others. The gallery also includes photographs and profiles of well-known human rights abusers as well as human rights defenders. 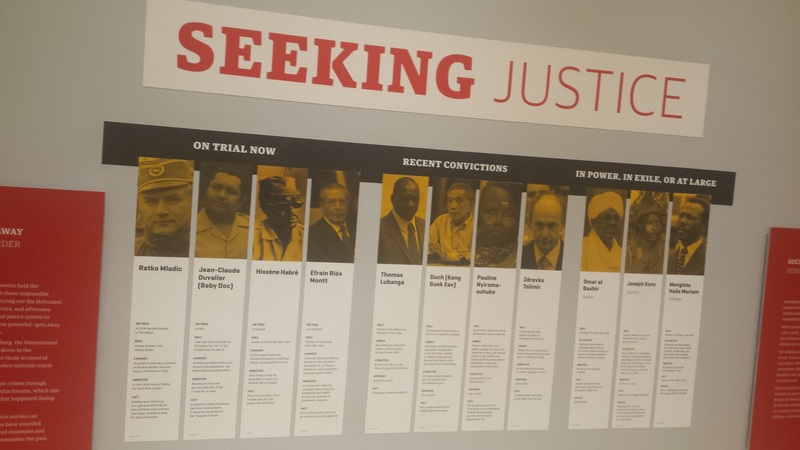 The gallery also includes panels featuring bios and videos of everyday individuals who have fought for human rights designed to inspire the rest of us to step up and take action. This is the newest museum I’ve visited; it had been open only 20 months at the time, and the seamless integration of up-to-date technology makes it extremely user friendly. 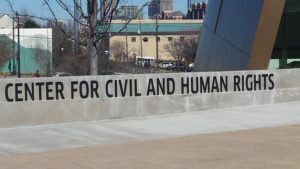 I also found it more manageable and less crammed with information than other Civil Rights museums, some of which I left feeling like I needed at least three more days to cover fully. Check back to read my post about my visit to the Noah Purifoy Outdoor Desert Art Museum in Joshua Tree, California.